Matthew 5:4- Blessed are they who mourn, for they shall be comforted. The loss of a loved one can hurt deeply. The mission of the Bereavement Ministry is to provide spiritual support and comfort to individuals and their families who experience the death of a loved one. Joseph of Arimathea was the man in the gospels who saw to the burial of Jesus. Those involved in this ministry reach out to those in grief, sharing their pain, listening to their stories, and bringing the Gospel message of hope into the midst of their sorrow. 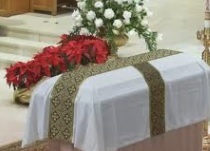 The bereavement minister is a sign of the love God has for Hs people and a sign of His presence with them, especially in this time of great sadness. 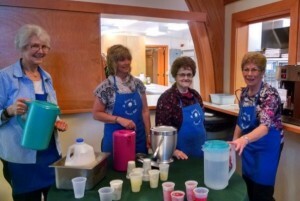 Funeral meals are considered a ministry of the Women’s Club. They are scheduled through the funeral homes who then contact Ann Clement (249-1363) from St. Louis the King who has a calling phone tree to contact parishioners to cook, bake and donate food.The Women’s Club prepares and serves the food following the funeral This is a wonderful ministry to our parishioners during this difficult time. Thank you Ladies in Blue for sharing so generously of your time and talents to be the face of our Loving Lord to others.